In 10-inch skillet, cook sesame seed over medium-high heat 3 to 5 minutes, stirring constantly, until lightly toasted. Remove from skillet to plate to cool. Heat oven to 375°F. In small bowl, beat butter, 1 tablespoon of the soy sauce, 1 teaspoon of the gingerroot and 2 tablespoons of the sesame seed with electric mixer on low speed until blended. Carefully unroll dough into 2 rectangles. On each of 2 ungreased cookie sheets with sides, place 1 rectangle; press into 8x6-inch rectangle. Spread with butter mixture. Using pizza cutter, cut each rectangle lengthwise into 6 breadsticks, then cut each breadstick crosswise into 8 pieces. Bake 8 to 12 minutes, rotating cookie sheets halfway through baking, until crisp. Remove from cookie sheet to cooling rack; cool. 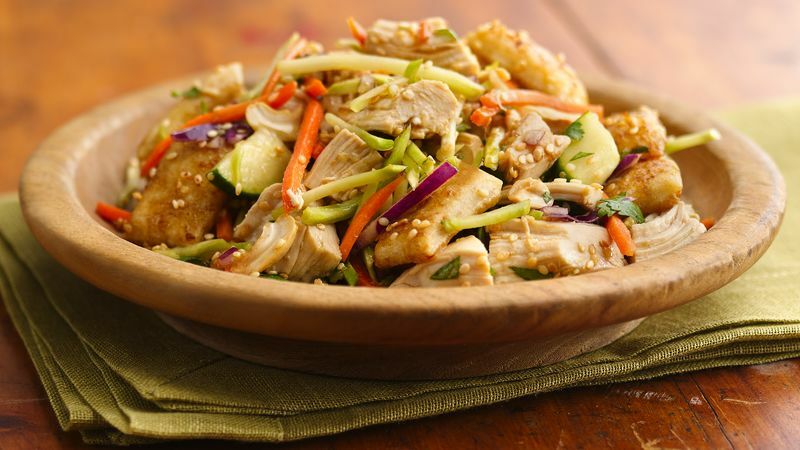 Meanwhile, in large bowl, toss chicken, broccoli slaw, cucumber, carrots, cilantro, onion and cashews. In container with tight-fitting lid, shake olive oil, vinegar, sesame oil, sugar and remaining soy sauce, gingerroot and sesame seed until well blended. Just before serving, pour dressing over chicken mixture; toss to coat. Add croutons; stir lightly.